Measurements: 2.75 x 4.15 inches, or 70 x 105 mm. Back of card: Solid sky blue. Two thin gold lines around the edge, in the center a fancy S with the ends in spirals. Can be inverted. The basic idea can be seen in the jar on the Ace of Cups, illustrated above. Book included: Yes, 157 pages, 4.65 x 7 inches, or 12 x 18 cm, by Kay Steventon. With black & white illustrations. Publisher: US Games. Deck printed in Belgium, book printed in Canada. Comments: From the back of the book: "Steventon compares The Fool's journey through the Tarot to the spiraling process of life experience. The 22 Major Arcana are presented as universal archetypes, using a mixture of Middle Eastern, Arthurian, and Mediterranean myths to describe the message of each card, reflecting the sum of our journey through life, and analyzing the symbolic importance of all of the characters and stages that influence our development as human beings." It helps to remember that Celts were once found, not only in the British Isles, but throughout the Mediterranean. Celtic remains can still be found on Corsica, for example. Steventon mixes things up. The Fool is Perceval, the Magician is Hermes, the High Priestess is Sophia, the Empress is Eve, (this is the order of the Major Arcana, by the way), the Emperor is Arthur, the Heirophant is Chiron, which is either the Centaur of Greek myth or the planetoid orbiting between Saturn & Uranus (take your pick), etc. Notes in the book for each Major Arcana card describe the myths associated with each, and associated myths. 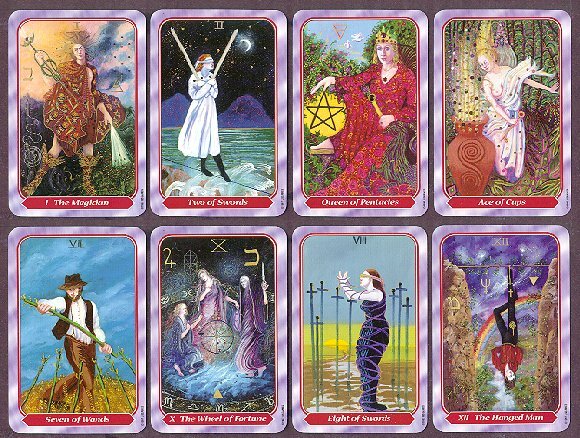 The minor arcana is described briefly, with the traditional (eg, Rider-Waite) meanings. Face cards are King, Queen, Knight & Princess. Suits are Cups, Pentacles, Swords & Wands. As for the spiral motif, remember that many surviving Celtic stone carvings include "cup & ring" marks, left-hand spirals that spin off to right hand spirals, etc., identical to the back of the cards. You can find reproductions of them in books of British archaeology.